The morning commute may be a drag but the opportunity to turn a few heads may smooth out the journey. So if you have about £200,000 kicking around in your sock drawer, that image in your head of cruising along the M1 in a Formula 1 car can become reality. 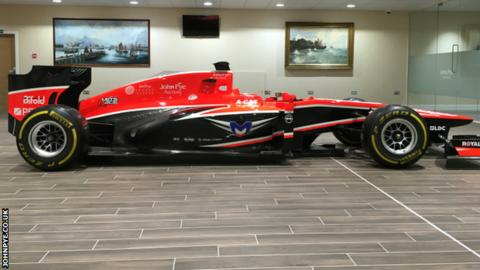 Seriously... it's all down to the fact four F1 cars from the Marussia family are up for sale. And while you may need a hefty wallet to support the fuel costs involved in owning an F1 model, maybe the outlay is worth it? The vehicles raced over four seasons between 2010 and 2013 - during which time the team changed its name from Virgin Racing to Marussia F1. The team - now called Manor Racing - entered administration for a month in 2015, but don't let that put you off raiding the piggy bank. Go on then, what will it cost me? What will my budget get me? Interested parties can buy the vehicles individually or as a collection - ideal if you would like one for the school run and one for the shops. But there will no bidding at a nerve-filled auction. Such is the rare nature of these vehicles, parties must provide offers on a 'private treaty basis' which the auctioneers will then relay to their client. "They have to be seen in person to be fully appreciated for their styling and engineering beauty," said Giorgio Vitale of John Pye Auctions, who are expecting "international interest". An outlay roughly the same size as what you need to cover the average UK house price is one worth mulling over. "The assets are the most modern F1 cars to have been made available on the international market," added Vitale. DRS - designed to limit drag and boost speed - is just one of the features on some of the vehicles. There are carbon fibre chassis and wishbone suspension but no new owner will be able to brag of their car winning any F1 honours. None of the Marussia or Virgin vehicles for sale has registered a single World Championship point. Still, if they are good enough for the streets of Monte Carlo or for the track at Silverstone, what are you waiting for?